We already reviewed one set of mechanical keyboards this year, but believe it or not there've been enough new releases in the months since that we're able to put together an entire second set of reviews. The craziest bit? 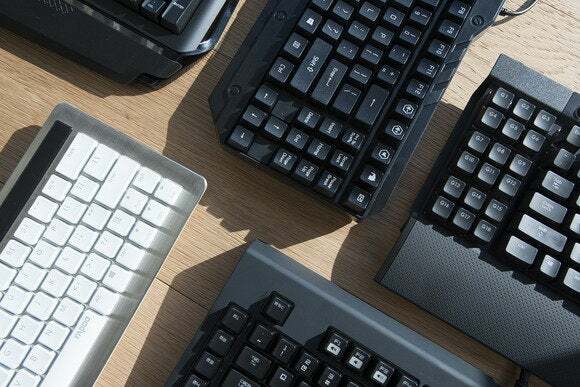 Out of the five mechanical keyboards in this roundup, only one (the Corsair K70 RGB/K95 RGB) uses Cherry MX switches—long the de-facto standard for all brands. That means my typical spiel about the four main kinds of Cherry switches (Red, Black, Brown, Blue) is basically worthless. If you are looking for that information because you're planning to purchase a K70 RGB or K95 RGB, I recommend checking out our previous roundup. It really makes you wonder, though: Now that Cherry's patent has run out, how many manufacturers will swap away? Will Cherry switches someday be as rare and coveted as the IBM Model M keyboard is nowadays? Cherry MX Blue switches give you a tactile bump as well as an audible click. Image by Castin Cramer. But I digress. Besides the K70 RGB/K95 RGB, we have four other keyboards. The Nixeus Moda uses "Brown" switches with the trademark "tactile bump"—but Brown switches manufactured by Kailh, not Cherry. The Rapoo KX also uses Kailh switches, but they're Yellows—linear switches with a 50cN actuation force that falls between Cherry Reds and Blacks. Razer's Blackwidow Chroma sticks with the Green switches found in the Blackwidow we reviewed earlier this year—although I'm pretty sure those Green switches were made in a partnership with Kailh also. And then there's Logitech, which introduces the exclusive Romer-G switch with its new G910 Orion Spark. The other big push this year has been in RGB-enabled lighting. We kicked off this year with zero RGB-enabled mechanical keyboards and end with three: The K70 RGB/K95 RGB, the G910 Orion Spark, and the Blackwidow Ultimate Chroma. All three take a different path toward RGB backlighting, but the results are the same. You can set one color across the entire board or tweak each individual key, allowing for complex profiles that (for instance) highlight useful keys in your favorite shooter or even change color to match the cooldown of your abilities in League of Legends or Dota 2. The possibilities are in theory endless, but it all comes down to your patience and the amount of community support each keyboard has, so we'll be taking a look at the included software also—how intuitive and accessible it is to newcomers. Of course, that bit doesn't apply to the Rapoo KX and the Nixeus Moda, which are both more standard keyboard models. Last but not least, we'll take a look at any "luxury" features. For instance, media keys are pretty standard on mechanical keyboards nowadays, but which implementation did the manufacturer go with? Volume buttons versus a volume scroll wheel? Dedicated media keys, or keys stamped onto the function buttons? It's a lot to cover, so let's get to it. Click through for our reviews of the Rapoo KX, Nixeus Moda, Corsair K70 RGB and K95 RGB, Logitech G910 Orion Spark, and Razer Blackwidow Chroma. And if none of these keyboards is doing it for you, remember to check out our previous mechanical keyboard roundup from earlier this year. The Rapoo KX is a dainty little device, perfect for the mechanical keyboard snob on the road. Desk use? Not so much. The Nixeus Moda is the most average of average mechanical keyboards, but it's sold for an excellent price. Razer finally ditches that neon green and black color scheme to let you choose your own adventure—if you're willing to pay. Logitech's G910 Orion Spark has the best lighting of any RGB keyboard, but its Romer-G switches leave a lot to be desired. Corsair's K70 RGB and K95 RGB should be the best RGB mechanical keyboards thanks to real Cherry MX switches, but the software side is a broken nightmare.